Christmas Day ISS 25 Dec 2013. The International Space Station (ISS) flies over East Midlands (1711hrs flyby). A very bright flyby over rural field in East Mids. How did I capture this? - Camera (Olympus E-M1) with fisheye lens (Oly 8mm) set on tripod. 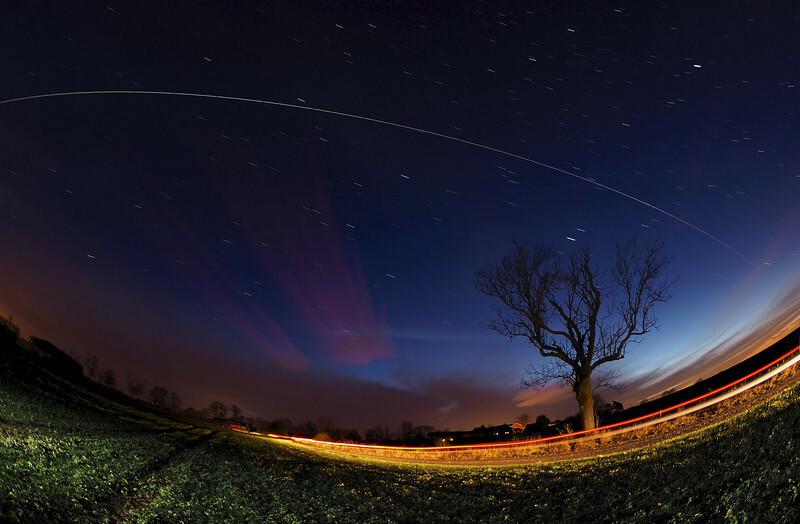 I located the camera in a field and composed around the tree, knowing the ISS would pass over from west to east. Setting camera in manual mode, f3.5, ISO 320 & 10s exposure time & using remote cable to shoot continuous for approx a dozen or so shots. The field was painted with a few flash bursts, although a passing car completed the job for me :-) Once complete I imported all images & stacked in software to produce this composite image.